Installing OpenPanel on localhost or actually your Ubuntu PC can be used for installation and management of various web softwares through a control panel. We previously shown the process of installing OpenPanel on server as Free Web Control panel, which has in the front end better graphics and clean interface than paid cPanel. The first thing you should know Installing OpenPanel on localhost or Ubuntu PC is“ if you have a Static IP, your www folder and WordPress is actually accessible by default from Internet. This is great if you want to use your Ubuntu 12.04 PC as a test server. But if you do not have a static IP or IP changes too fast, then use http://localhost/ in browser or usual http://127.0.0.1/ IP to access your test installation. Second is, OpenPanel is designed to be installed on a clean Ubuntu 11.04 (Natty) or Ubuntu 11.10 (Oneiric) server. Having other web control packages packages installed can be a problem. So, be mentally prepared with a backup if you have installed hundreds of web control panel before hand. 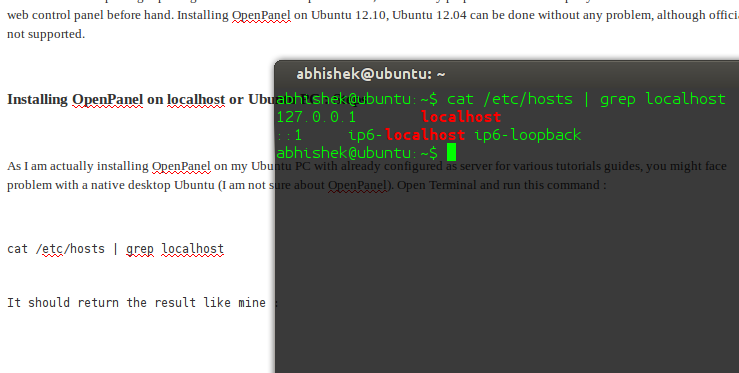 Installing OpenPanel on Ubuntu 12.10, Ubuntu 12.04 can be done without any problem, although officially not supported. It is a funny screen shot. I took it while typing and dragged it on writing pane in WordPress. If it returns error, please install Apache2 (check Ubuntu docs or ask in forum). This Article Has Been Shared 8667 Times! Links command line interface based browser with Graphics can only be enabled on OS X with make function. During the build process, one need to enable graphics. Cite this article as: Abhishek Ghosh, "Installing OpenPanel on localhost (Ubuntu PC)," in The Customize Windows, October 20, 2012, April 19, 2019, https://thecustomizewindows.com/2012/10/installing-openpanel-on-localhost-ubuntu-pc/.